The farm works with other farmers on market and policy alternatives that protect and maintain biodiversity while supporting local farms that provide healthy, locally raised meat. The owners advocate for policies and practices that sustain small family farms. The farm store is solar-powered and solar-heated and sells the farm's beef (both fresh and frozen), as well as chicken, duck, pork, milk, eggs, baked goods, and more. Miles Smith Farm also offers a country inn experience in a private apartment in the farm house. 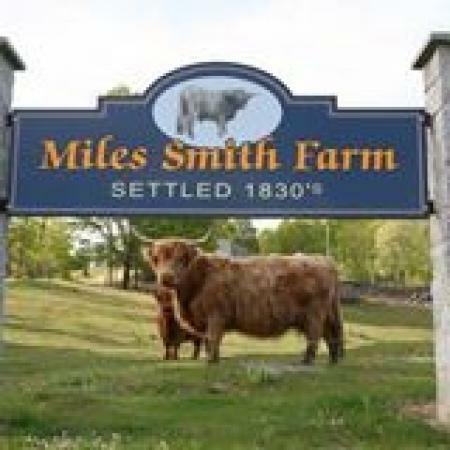 Miles Smith Farm is working farm that is family friendly. You'll never know what adventure will be in progress when you visit. They might be moving the cattle between pastures, rounding up the pigs or, in the spring, you might witness a calf being born. A great place for the whole family.